Other Details: Operates daily from 21 July 2012 to 2 September 2012. Citybus are back on the Bovisand route after a good few years when the service has been with Target Travel. Sadly the service is most likely to be operated by standard Dennis Darts rather than a return to open top double deckers. The overgrowing trees along the route mean such a service is no longer possible even if the will was there. ©Syd Eade June 1975 - with permission. If they cut the tress back on the route they could do it. Then all they would have to do is 'borrow' one the convertibles from Wilts & Dorset to operate it! the bus in the picture is owned by the plymouth city transport preservation group. maybe if citybus replaced the upstairs floor and painted it as in the picture, we could loan it to them! they would have to borrow it for tree lopping first! Didn't the 54 used to be the Hoe open-topper? Yes the 54 was the Seafront Circular service. This operated from the City Centre to the Barbican and the Hoe. Although in 1988 the route was altered with the 54 becoming the Armada Tour and operating right around the city every hour (but not on a Saturday!) The 54A kept the shorter seafront service that year running hourly and I believe every half hour on Saturdays. 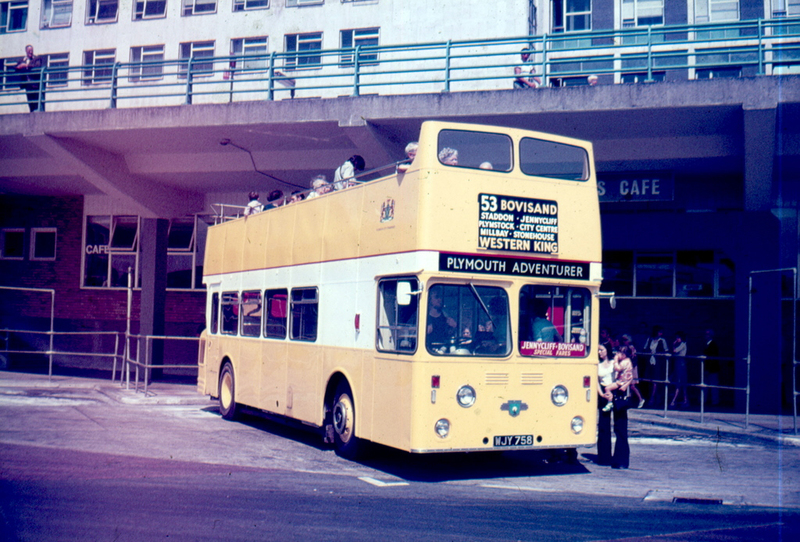 Not since the summer of 1990 have Plymouth Citybus operated on the Bovisand route. It would be good to see this route returned to open top service and I'm sure it could be popular again. I remember the late 1970s and early 1980s when the 53 would be regularly packed with no seats left upstairs and that was with an every 30 minute frequency.